As I worked my way through Julius Caesar, I couldn’t help but have a feeling of familiarity. Somehow the way all of these Roman diplomats were talking behind each others’ backs was eliciting some deja vu. Then it hit me, they were acting like a bunch of high school girls. And I want to be clear, as a former high school girl, I think pretty highly of the capabilities and intelligence of high school girls. However, hormones and certain societal expectations can make high school girls act a little catty. We are all familiar with the mean girl stereotype, made famous by the 2004 film. It’s not all false…I’ll just leave it there. 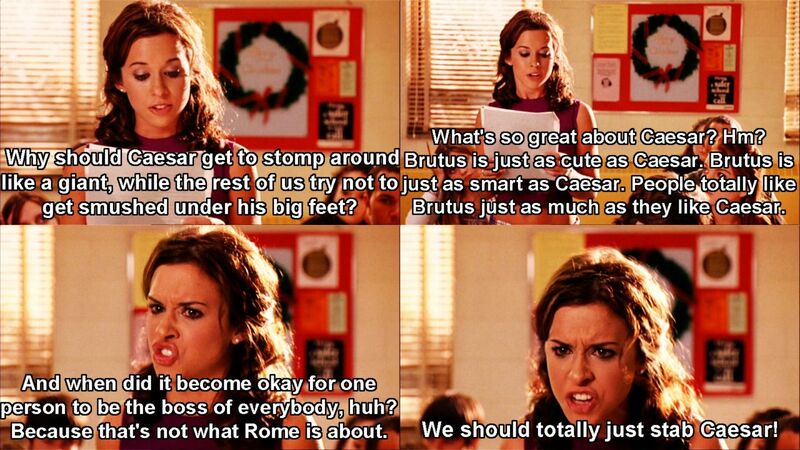 ANYWAY, Caesar and Cassius specifically very much act like stereotypical mean girls. I suppose this shouldn’t be surprising considering we have literal backstabbing going on in the play. I mentioned this to my husband and we immediately started translating lines of the plays into language that a mean girl might use. We were crying with laughter. Then it occurred to me, this could be an excellent exercise for students. Most Shakespeare characters could fit into some stereotype, so wouldn’t it be great to let students play with character-types in this way? Cassius doesn’t like that Caesar is getting all this attention. At its core, the beef between Cassius and Caesar is essentially a popularity contest that Cassius lost. That’s why Cassius wants to take Caesar down. Cassius argues to Brutus that there is no reason Caesar should be so highly praised. After all, Cassius had saved Caesar’s life while they were racing in the river. Think Gretchen Wieners’ speech in Mean Girls. Caesar doesn’t like Cassius because Cassius is a nerd. Caesar pulls Antony aside to discuss precisely why they don’t like Cassius. Caesar basically starts by saying he wants to be surrounded with ugly people. Also, he doesn’t like Cassius because he “thinks too much.” Antony attempts to stand up for Cassius, but Caesar dismisses it and tells Antony to be honest. This was the exchange that made me realize they were a bunch of catty beotches. After engaging in this whole theatrical refusing the crown display, Caesar decides the best thing to do is cut down Cassius because Cassius is essentially a nerd. There’s…just…sooooo much gossip. Marc Antony reaches new levels of throwing shade. The epitome of our exercise was Marc Antony’s speech to the people. The entire speech is peppered with “and Brutus is an honorable man.” If Marc Antony were tweeting, he would definitely be using the hashtag #shade or #sarcasm. He gives all these reasons why Caesar was a pretty great guy. Then, he teases Caesar’s will. Then, he off-the-cuff reveals what is in the will. Then, after the people practically begged him, he “reluctantly” read the will. It is so very sneaky. Antony has reached next level pettiness. It’s almost admirable. That’s just a little peek at what I did with Julius Caesar. What are some other plays and characters that could get a similar treatment? Let me know in the comments down below.